Lying on the banks of the river Liffey opposite the Guinness Brewery lies the National Museum of Ireland – Collins Barracks. In a previous life Collins Barracks was once the oldest occupied barracks in Europe. Built by the British in 1702 it was taken over by the Irish in 1922. Formerly known as the Royal Barracks, it is one of the earliest public buildings in Dublin. It was built on a site originally intended for a mansion for the Duke of Ormonde. Throughout its tenure it was occupied by numerous military units, both Irish and British. When the last soldiers marched out of the barracks at the start of the 21st century the ghosts of the previous incumbents were left behind. Thankfully the barracks has now been restored to its former glory by the National Museum of Ireland and at the moment the very impressive “Soldiers and Chiefs” exhibition is ongoing in the Museum. This exhibition outlines the numerous armies and campaigns that Irish soldiers have participated in throughout the ages. From Fontenoy to Fredericksburg and Sevastopol to Spion Kop, Irish soldiers have fought and served with distinction in most of the worlds conflicts over the last 500 years. The “Soldiers and Chiefs” exhibition outlines the various armies and conflicts that Irish soldiers have served in. There is also a section on the foundation of the State 1913 -23 and the history of the Irish Defence Forces including its proud record of overseas service from the Lebanon in 1958 to current missions in Kosovo and Chad. Of particular interest for the people of Kilkenny is a very ornate bandsman’s uniform on display at the beginning of the exhibition. This uniform is from the 20th Kilkenny Militia and dates from the mid 19th century. Early military bandsmen wore special uniforms often influenced by continental fashions, particularly noticeable in the cylindrical headdress. It became the fashion for Infantry bands both regular and militia to wear white with the Regimental facing colour, in this case yellow. 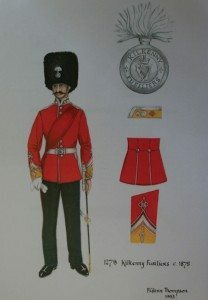 This practice ceased about 1871 when they wore red tunics like the rest of the regiment. They did however wear shoulder wings and lace on the seams of their tunic sleeves to distinguish them. Kilkenny Militia bandsmanIn 19th century Ireland the British Army often gave free band concerts for the public on Sunday afternoons. Such performances provided inexpensive entertainment for the local population, while reminding people of the presence of the Army in their community. The Irish militia were first formed in county regiments in 1661 by the Lord Lieutenant of Ireland – the Duke of Ormonde (mentioned above), head of the renowned Kilkenny-based Butler family. Henceforth the county title was the official title of the associated militia regiments. Until the outbreak of war with France in 1793 Irish Catholics were forbidden to bear arms or join any branch of the armed forces. The potential threat of invasion of England and the need for more soldiers caused the London Parliament to enact a law to remove the prohibition on the recruitment of Catholics and make them, like Protestants, liable for militia service. The Kilkenny Regiment of Militia was henceforth more representative of the people of the county. In 1881, with the application of a Territorial system, all British Army infantry regiments, both regular and militia were ‘localised’ – allocated a specific depot barracks and prescribed counties to form their recruiting areas. The 18th Royal Irish Regiment – the oldest Irish infantry regiment in the British Army – was allocated a depot in Clonmel, and the counties of Tipperary, Kilkenny, Waterford and Wexford formed its recruiting area. The militia regiments in those counties became battalions of the 18th Royal Irish Regiment. The Kilkenny Regiment was designated the 5th (Militia) Battalion of the Regiment. In 1908 it was redesignated the 4th (Extra Reserve) Battalion. The Royal Irish Regiment was heavily involved in World War I seeing action on the Western Front, Gallipoli, Salonika and Palestine. Numerous men from Kilkenny and the South East fought and died in these theatres of war. The 4th (Extra Reserve) Battalion Royal Irish Regiment was predominately stationed in Ireland and England 1914 -18 and acted as a feeder unit for the more active Battalions. The Regiment, along with the other Irish regiments raised in Southern Ireland, were disbanded in 1922. This also ended the Kilkenny Militia.